This is the type of problem Buhrke Industries was experiencing with a custom part it manufactures for an automotive airbag assembly. 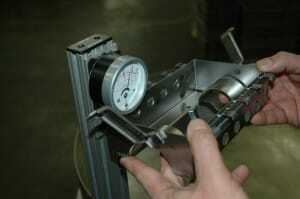 Throughout the manufacturing process, the stamped assembly housing was becoming magnetized. This magnetism was attracting small particles to the part, and ultimately affecting its overall appearance. Amaro said the welding involved in making the robotic airbag housing causes the part to become magnetized. Welding involves high current, and anytime current is passed through a conductor or plasma arc, it generates a magnetic field. While some welding can produce magnetic arc blow, which is a more serious problem that can affect the integrity of the welds, the issue for Buhrke Industries was that the part was becoming magnetized just enough to attract small metal particles. To solve the problem, Amaro added both a demagnetizer to the production line and a conveyor to help improve product flow. Before the issue was identified, the robotic airbag housing assemblies traveled down a chute and collected together on a table. Often, the parts would back up into one another before each was individually inspected by Veljko Sisarica, a long-time employee of the company. A demagnetizer was installed at the chute to remove magnetic values from passing housing assemblies. However, installing the demagnetizer created another issue for Amaro to address: the housing assemblies needed to travel a few feet away from the demagnetizer so as not to interfere with its operation. Existing product flow slid the assemblies onto the table only about eight inches from the demagnetizer; rather, they needed to be a distance of about three feet . 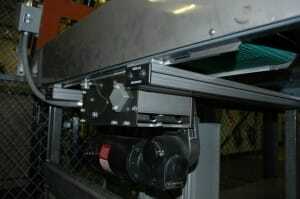 The solution was to install a conveyor into the table that would allow housing assemblies to slide down the chute and onto the conveyor, moving them the proper distance away from the demagnetizer. 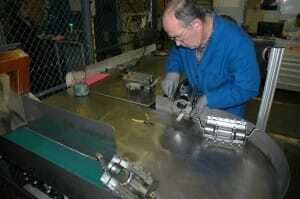 Buhrke Industries uses more than 20 Dorner conveyors in a variety of more clean-room environments. After cutting out a space on the table, Amaro re-purposed a spare Dorner 2200 Series center drive conveyor from a previous operation, so that the conveyor belt was flush with the table. Two tall guide strips were mounted on the table alongside the three-foot long, six-inch wide conveyor to keep housing assemblies positioned straight on the belt and as they discharged onto the table. The conveyor worked as anticipated, but Amaro soon noticed that parts were still backing up on the conveyor and not traveling the proper distance away from the demagnetizer. The problem was as assembly housings began backing up on the conveyor the belt was too slick to provide enough grip to keep them moving onto the table. Amaro received a selection of belt swatches to try out. The new belt, a high friction type 64, arrived in three days, and conveyor was back in service.